IT was the success of the Liverpool and Manchester Railway which was responsible for the projection of a means of connecting Bristol to London by the steel highway, as a faster alternative way of communication to the circuitous canal route then in vogue. Directly the suggestion came before the public it received the inevitable hostile criticism, because the projectors were treading on the toes of scores of other interests, who viewed the Stephenson invention with undisguised disfavour. The scheme languished for many years, until at last in 1832 a strong influential committee was formed to carry the idea into effect. This commercial body knew nothing about the technical problems involved. and they east about for an engineer. Among the aspirants was that engineering genius Isambard Kingdom Brunel, then only twenty-seven years of age. Although young, he had already carved out a unique reputation, and he carried the day; and became the first engineer of the Great Western Railway. Although the promoters only intended to connect London with Bristol, they failed to secure the necessary support. Accord-ingly they decided to construct the line piecemeal, so that when the first application was made to Parliament it was for two pieces of line running respectively from London to Reading, 36 miles, and from Bristol to Bath, about 10 miles. The interests supporting the scheme concluded that if these wedges were driven home it would be an easy matter to span the inter-vening gap of 72 miles. Even then they experienced a stiff uphill fight owing to the strength of opposing vested interests, so that it was not until August 31st 1835, that King William IV appended his signature to the London and Bristol Railway Bill. In his constructional work Brunel was harassed by some of his controlling associates. He did not progress so rapidly as they desired. On more than one occasion he was within an ace of being superseded; proposals to bring in George Stephenson to straighten matters out were made frequently. When the line was opened it proved sadly lacking in many constructional respects, and there is no doubt but that for the unswerving support extended by one or two of the directors, the young engineer’s connection with the railway would have terminated abruptly. Stephenson’s by any means. He merely adapted his radical revolution to existing ideas. On the other hand, Brunel considered this gauge unsuited to high speed, carrying capacity, and safety. So he elaborated a gauge of his own, 7 feet, 0¼ inches, and strangely enough this was adopted for the Great Western. Certainly he justified his contentions, but they afforded no argument. There is no doubt that Brunel was supported in his gauge ideas by the desire to create a monopoly for the Great Western. In the early days of of the railway building the country was divided off into zones, and the concerns interested in railway transportation agreed to respect certain boundaries. Interchange of traffic was the last thought entertained - at least, by Brunel, though it was foreseen by Stephenson and others. The “Battle of the Gauges” was waged keenly in Great Britain, but the narrower gauge won, the Great Western Railway had to bow to the inevitable, and was forced to the Stephenson gauge, although the change was not effected until 1892. By means of a third rail to standard gauge inter-working had, however, been practised for some time. But if Brunel proved to be in error in regard to the question of gauge, he was far more perspicacious concerning the over-whelming advantage possessed by the straight level line. In running the surveys he kept down banks and avoided sharp curvature. The advantage of this is shown to-day. True, overhaul has been necessary, but it has not involved wholesale revision and reconstruction of the road, as has been the case in other parts of the world. The Great Western now is practically as Brunel left it concerning location; it merely has been improved in accordance with the marches of railway progress. Brunel aimed at high speeds, and big running performances, which explains why the Great Western Railway is one of the finest and fastest railway galloping grounds in the world, enabling trains to run the 118 miles between London and Bristol in 120 minutes, as well as the establishment of the longest and quickest non-stop runs - 143 miles to Taunton in 150 minutes; 174 miles to Exeter in 180 minutes; and 225¾ miles to Plymouth in 247 minutes. The first 23 miles of the railway out of London were completed to Maidenhead in 1838. It was a badly-built stretch of track, and the public were loud in their complaint concerning oscillation and jolting. The question to decide was how much was due to the permanent way and how much to the rolling stock. Under the weight of the trains the track went all to pieces within a very short time. Brunel, with characteristic courage, acknowledged that the road was in a bad state and divined two reasons for its break-up - insufficient ballasting, or the use of fine instead of coarse gravel. The logical solution was attempted. Two half-mile stretches of track were ballasted upon divergent lines to test the respective values of each method. The following instances afford some idea of the quaint opposition which railway projects received in those days: The town of Maidenhead rose up in arms against the railway because it approached their boundaries too closely. On the other hand, Windsor became fiercely hostile because it left them too far to one side. Eton College regarded the line with deep-rooted objection, and brought an action to prevent the railway establishing a station at Slough. This effort received the scant consideration it deserved; it was dismissed. 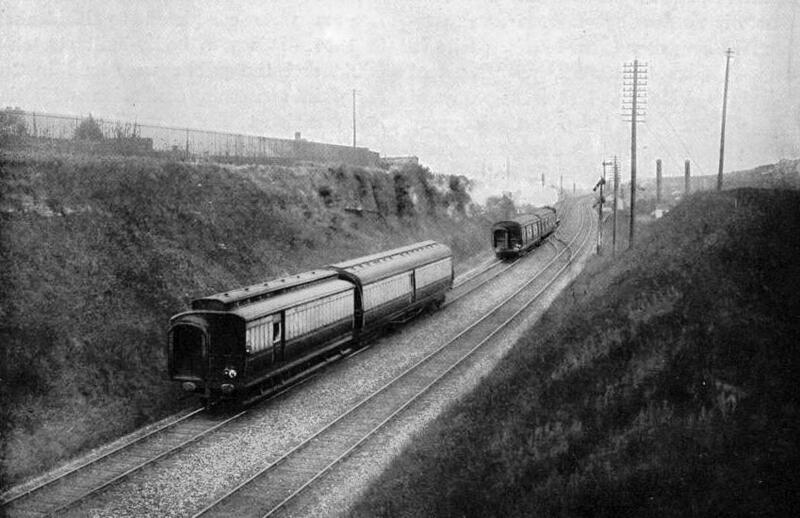 A little later the self-same authorities requested the company to provide a train at the disputed stopping-place in order to convey the boys to London. Some of the farmers adjoining the right of way grew apprehensive that the smoke would suffocate their live stock, while residents firmly believed that they would be driven frantic by the noise of the passing trains. The River Thames offered the first serious obstacle to the western advance of the railway. At this point the river is some 207 feet in width, and divided near the centre by a shoal. As the banks are somewhat low, and the gradient is maintained on either side, Brunel was somewhat hampered in his design so as to not encroach too much upon the headroom for navigation. He decided to introduce two main spans, each of 128 feet, and with a very flat elliptical arch. Brick was selected, and the work ranks as one of the largest structures of its kind ever attempted in this constructional material. Its erection, however, was not free from incident. The contractor, no doubt harried somewhat by the powers above, took away the centres too soon, with the result that a deformation set in. The administration, after Brunel had made an inspection, held the contractor responsible for the damage, and compelled him to repair it. In the meantime the most extraordinary stories relative to the incident had been circulated, and it was only with difficulty that the anxiety of the shareholders was allayed. By March, 1840, the original proposal was completed; the line was opened to Reading, and in the same year the Bristol to Bath section was finished. Without any delay the line was continued from each end so as to close the gap in the comm-unication between Bristol and London. Going westwards little difficulty was experienced, inasmuch as the country threaded is fairly level, but coming eastwards from Bath the 13 miles were somewhat heavy, involving the introduction of two steep banks of 1 in 100 - the Wootton Bassett and the Box - on which a “double header” or a “pusher” engine had to be used for several years. In this section the engineer also had to drive the Box Tunnel, 3,212 yards in length, which, however, did not prove a very difficult undertaking, owing to the regular character of the rock encountered, although it occupied some time. At last, on June 30th, 1841, the original project was realised; the London and Bristol Railway was opened. The original line, forming the basis of the Great Western Railway, always has been famous for the high running speeds attained thereon. Certainly the location and alignment are conducive to this result. 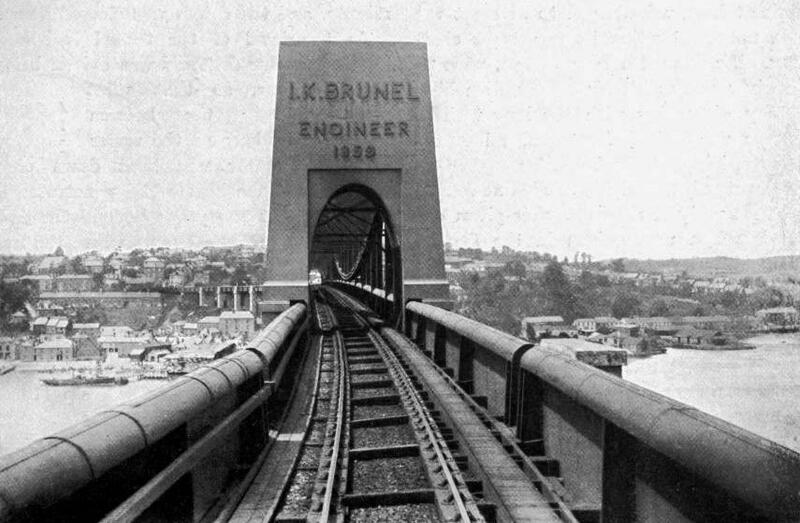 Between the two points the railway only has to rise to a matter of 270 feet above the metropolis, and then drop 292 feet into Bristol. Of the 118 miles no less than 67 either are level or rise only 4 feet per mile, while another 17 miles have grades ranging between 4 and 8 feet per mile. The remaining section is made up of the two short banks, rising 1 in 100, against eastbound traffic. As may be supposed, while this railway was under construction, further lines in conjunction therewith were projected and carried into effect. An obvious extension was from Bristol to Exeter, built by another company and opened in 1844. In due course came the South Devon and Cornwall lines. The various sections being in connection, it was possible to travel by rail from London to Plymouth and beyond. When the Great Western Railway had become firmly established, a policy of absorption was followed, so that slowly but surely innumerable short links were bought up and amalgamated with the parent concern. Under this policy the company became entrenched firmly throughout the south-west and west of England. 1,100 feet wide, with a depth of 80 feet at high water. 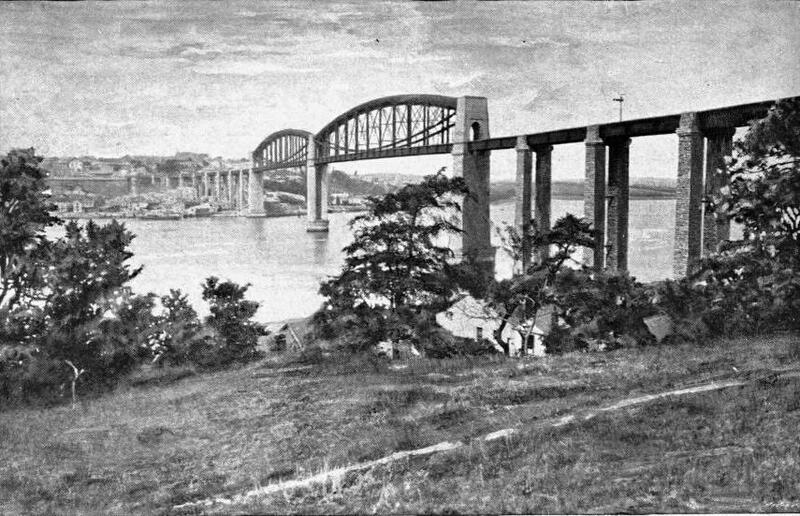 At first the obstacle appeared to be so formidable that a steam ferry was projected, but at last it was realised that a bridge was the true link of communication, and a point at Saltash was selected for the crossing. A design was prepared, to be executed in timber, having one span of 225 feet, and six spans each of 105 feet. Doubtless this project would have been undertaken had the Government not interfered. Devonport naval base is close by, and the Admiralty insisted that the waterway should be kept clear, that at least 100 feet of headway should be provided, and that there should be only five spans. Faced with this irreducible minimum Brunel evolved a startling design. The bed of the Tamar is somewhat unstable, and the building of piers in deep water always is a costly and tedious proceeding. Brunel boldly decided to introduce only two main spans, thereby reducing subaqueous work to one pier in the channel. This entailed two big spans, each of 455 feet. The foundations and under-water operations upon the central pier offered the most perplexing problem, however, owing to the great depth of water. Alter considerable reflection the engineer decided to build the pier upon the caisson system, although it involved a huge structure and operations upon a scale which never had been attempted up to this time. The massive cylinder was 95 feet in length by 35 feet in diameter. In this cylinder a diving bell was improvised, about 20 feet above the lower end, and from the centre of this extended a smaller tube 10 feet in diameter. Inside the diving bell was placed another cylinder, 27 feet in diameter, divided vertically into 11 compartments, each of which was kept dry by compressed air. In this way the compressed air working space was confined to a ring of compartments, instead of the whole area beneath the dome. The air-lock was placed on top of a tube 6 feet in diameter, set to one side of the central 10-feet tube. Some difficulty was experienced in sinking the cumbersome caisson in the desired position, owing to the configuration of the river bed. Once it tilted alarmingly, but was righted, and then settled down in the designed vertical position. In the course of some eight months it was sunk to the solid rock, the bottom edge being 87½ feet below high water. Once the caisson was bedded the substructure proceeded rapidly. The masons set the ashlar granite masonry in the com-pressed air compartments, the material within the core was removed and filled up, the inner caisson removed, together with the diving bell, and lastly the outer cylinder was dismantled. By the end of 1850 the pier had been brought to a height of 12 feet above the water, and the most searching and anxious part of the task was completed. 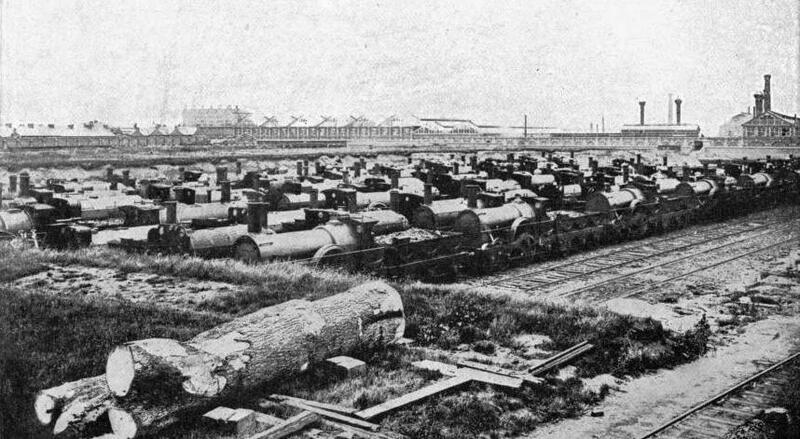 A LOCOMOTIVE GRAVEYARD - BROAD GAUGE ENGINES AT SWINDON STATION, MAY, 1892. Withdrawn from service by the conversion of the gauge from 7 feet to 4 feet 8½ inches. While the subaqueous work was in progress the two huge spans were taken in hand. They are of unusual design, comprising a combination of the tubular and suspension bridge principles. The top member of the truss is an arched elliptical tube, 16¾ feet wide, 12¼ feet deep, by 100 feet in length, carried out in wrought iron. From end to end on each side there are heavy suspension chains. At eleven points, on each side of the tube, are vertical struts, braced by diagonal ties, whereby the chains are connected to the tube. The track floor is a horizontal girder suspended from the truss, the depth of the latter in the centre being 50 feet. When completed each span weighed 1,060 tons. rose it lifted the pontoon and the span, until at last the steel was supported entirely on the pontoons. The mass of steel was floated out into the river and warped into position between the central and the shore piers. Five vessels were stationed in the river for this purpose, and by cable and capstan the floating deadweight was brought into place. In this work alone some 500 men were requisitioned under the personal supervision of Brunel. Water was admitted into the pontoons, causing them to sink, when they were drawn clear, leaving the ends of the span resting upon the bases of the piers. The truss itself was lifted gradually as the masonry work on the piers proceeded. Three hydraulic presses were placed under each end of the truss, and at a given signal the structure was lifted about 3 feet. The masons then built up the pier in the under space, when the steel was lifted once more. By this novel lifting and building alternately the iron work was raised to its designed height. When the first span was completed the second was taken in hand and the cycle of operations was repeated. On this occasion, however. Brunel was unable to direct operations, having been stricken down by illness. The bridge was completed, and opened by the Prince Consort, after whom it is named, on May 3rd, 1859. Its total length, including the viaduct approaches on each bank, is 2,200 feet, the rails being laid at 110 feet above high water. It carries a single track, Brunel having decided that thereby £100,000 might be saved in first cost. This was a vital consideration in those days, and needless to say was adopted with alacrity. Although the line on either side is double, no serious incon-venience ever has been experienced in working over this short length of single track. Its total cost was £225,000. This was the last big work carried out by the master-mind, and, helpless on a couch, he was drawn across the bridge upon its completion, to see his creation for the first and last time. Previous to the construction of the Saltash Bridge Brunel had accomplished some remarkably striking feats in carrying the railway through rugged Cornwall. The broken character of the country, and the lack of funds, compelled him to introduce some stiff gradients and sharp curves. Still, the most noticeable features of this line were the timber viaducts, spanning the deep ravines. Some of these structures were of formidable proportions, the Landore Viaduct, for instance, being 1,700 feet in length, comprising 37 openings varying from 40 to 100 feet, while the St. Pinnock Viaduct brought the rail level 103 feet above tihe floor of the valley. The Walkham Viaduct of fifteen spans was 1,100 feet from end to end, and in the highest part 132 feet above the bottom of the rift. Wood was utilised as a constructional material to save expense, and the design comprised timber towers erected on masonry piers, with the deck carried on fan-shaped trusses. So substantial were these structures that on the early American railroads Brunel’s design was followed, and it is only during later years that the present form of timber trestling has been adopted. In revising and modernising the Cornish line the Great Western Railway replaced the timber structures by masonry and steel. Seeing that over sixty structures had to be replaced in this manner some idea of the magnitude of this modernisation work may be gained. 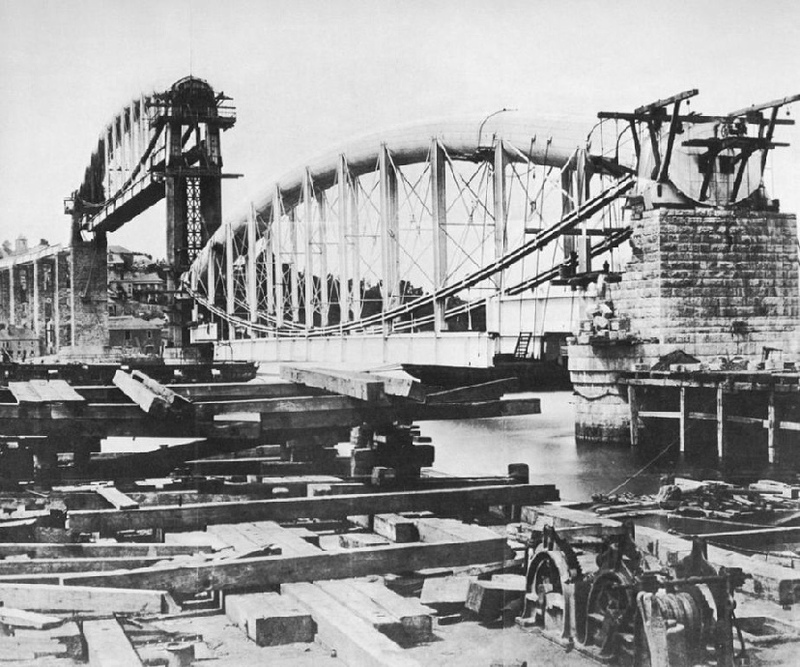 Re-erection was carried out with very slight dislocation of traffic, although in the case of the Landore Viaduct the difficulties encountered were so peculiar it was feared that reconstruction under traffic conditions would be impossible. But an English engineer undertook the responsible task and completed it successfully without a hitch. 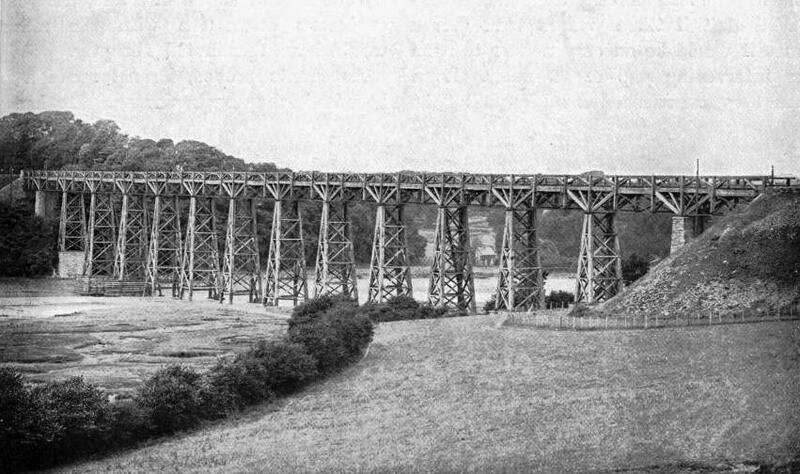 Whereas the old timber viaducts carried only a single line, the new bridges have a double road, so that the Cornish railway has been brought into conformity with the remainder of the Great Western Railway. But possibly the greatest engineering work associated with the Great Western Railway is the link whereby through railway communication is effected between the English and Welsh banks of the River Severn. In 1857 a company was incorporated, under the title of the Bristol and South Wales Union Railway, to run a line from Bristol into the Principality, the interruption of 2½ miles wide offered by the waterway being overcome by a steam ferry. In 1868 the Great Western acquired this railway, but the water-break was found to be a serious handicap to traffic. Accordingly parliamentary powers were sought, and obtained in 1872, authorising a tunnel beneath the river, upon which the railway company started in March, 1873, with Mr. Charles Richardson, a pupil of Brunel, in charge of the works. The designs called for a double track bore 7,664 yards in length, with approaches rising 1 in 90 on the English and 1 in 100 on the Welsh shores respectively, between New Passage and Portskewet, although the river is only some 2¼ miles wide at this point. It was necessary to dip down somewhat deeply in order to clear the hollows in the bed of the river, one such depression, known as the “Shoots”, half-a-mile from the west shore, having a depth of about 100 feet at high water. According to the plans a depth of 30 feet was provided between the water and the crown of the tunnel. Trouble with water was anticipated, owing to the geological formation comprising shale, sandstones and marl, but even the worst anticipations were exceeded eventually. The Great Western Railway undertook the task and prosecuted it sedulously for six and a half years. On October 16th, 1871, there was a terrific water-burst. A spring let loose a stream of water, 7 feet in width by over 12 inches deep, which poured down the steep driftway like a mill-race and flooded the whole of the works when the driftways, driven from the opposite banks, were within 130 yards of each other. The total length, including approaches, is 2,200 feet, and the single track is 110 feet above high water. All efforts to cope with the inundation with the existing pumping plant proved fruitless, so that work was brought to a standstill. The expert assistance of Sir John Hawkshaw, who had been consulting engineer up to this point, was called in, and he instantly recommended drastic expedients which were beyond the railway company. Thereupon the latter decided to withdraw from the undertaking, to place the whole responsibility upon Sir John Hawkshaw, and to let the work to contract. Mr. T. A. Walker, the well-known constructional engineer, secured the enterprise, and steps at once were taken to check the flow of water. Heavy oak shields were built and lowered into the water to be attached to the sides of the driftways, fitted with massive doors, so as to divide the bore into sections. One doorway was placed beneath the river itself, 330 yards from the shaft, and time after time divers descended to close this portal, but in vain. They were forced to retreat on every occasion. Finally, Diver Lambert, one of the most expert of submarine toilers, volunteered to attempt the task, notwithstanding its dangerous character. He donned a Fleuss dress, wherein the diver carries his air supply with him, thereby dispensing with the long trail of air-pipe which had frustrated all efforts hitherto. He started off, and for 85 minutes nothing was heard of him. Had he failed; had the supply of respiratory air given out and left him unconscious in the flooded bore? 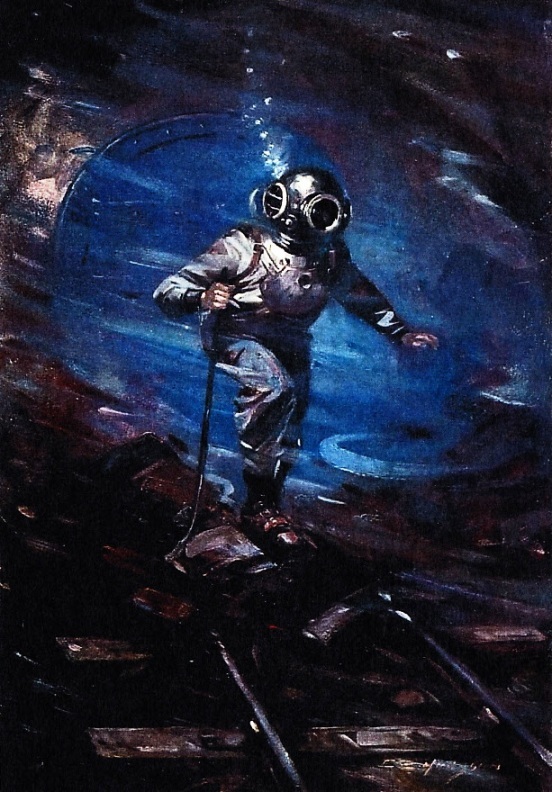 It was an anxious time to those above; they realised the gravity of the task confronting the intrepid diver, who was forced to stumble through a rough, uneven passage under the river. Just as speculation concerning his safety had risen to fever point he was discerned returning. He had closed the door and the water was held up. In the meantime another door had been placed across the heading down which the water was rushing. Directly this was closed the inflow was dammed back. When the water-burst occurred several springs and wells in the vicinity dried up, while the River Nedern shrank to a brook, thus testifying only too palpably that the water which normally fed them was finding another outlet. Directly Lambert had closed the door the springs and wells returned to life, while the Nedern resumed its normal level. THE FLOODING OF THE SEVERN TUNNEL. Owing to the water breaking into and flooding the workings, boring was brought to a standstill until Diver Lambert volunteered to penetrate the heading to close a heavy door isolating the affected section, in which daring task he was successful. Meanwhile Sir John Hawkshaw, having been appointed chief engineer, had revised the plans. He lowered the tunnel by 15 feet, thereby increasing the depth between the roof and the river bed to 15 feet. No attempt to remove the water held back by the door was made until 3½ years later, during which time a new pumping shaft was sunk. When the water was cleared out it was found that a part of the roof had fallen in behind the door, leaving a cavity 40 feet in height. The pumps were kept going removing the 6,000 gallons of water which poured in every minute, and the debris was cleared away. As the level of the tunnel had been lowered, a new driftway was driven below the old one, so that what was originally the bottom heading now became the upper one. The water was kept down completely until the borers had penetrated to a point about 100 yards beyond the door which Lambert had closed, where the first water-burst was encountered. Then came another dramatic inundation. Whereas in the first instance the water had entered from the side and roof, in this instance it burst up from the bottom, and in such volume that the works were filled up to a level of 95 feet in fifty-one hours. The inrush was so sudden that three out of the seven men working at the spot were overwhelmed and drowned. It was estimated that the water entered the workings at the rate of 27,000 gallons per minute, while as the pumps could only cope with 11,000 gallons per minute, they were overtaxed hopelessly, But they were kept going incessantly night and day for three weeks, and gradually reduced the level of the water, but the struggle for mastery was a stern one, the gain not exceeding 7 inches in the course of 24 hours. The new driftway, like the old, had been fitted with doors as a precaution, but whereas the men closed the upper one in their rush, the lower door could not be pushed against the water pressure. Before anything could be done it was essential that this door should be closed. It demanded a diver, and he had a crawl of 150 yards to the spot from the bottom of the shaft. Again Diver Lambert came to the rescue. In an ordinary diving suit, and with the assistance of two comrades, one standing at the bottom of the shaft and another about 75 yards along the tunnel to manipulate his air pipe, he succeeded in reaching and closing the door. When this was accomplished the level of the water was reduced speedily, and as soon as the tunnel could be entered a massive wall, 15 feet in thickness, was thrown up across the bore 88 yards from the shaft. This was equipped with a heavy iron door, together with sluices, and directly the pumping machinery had been increased, so as to lift 27,000 gallons of water per minute, the flooded area was cleared. It was found in this instance that the incoming water had torn a huge hole in the floor of the driftway. This was filled with clay puddle, and covered with a mound of the same material in bags. Subsequently this mound was levelled off and covered with concrete. A little farther on another fall of the roof was found. This was a fortunate discovery, as otherwise another inundation would have resulted. This disaster was avoided by timbering up the roof with all speed, and finally bricking it in cement when the tunnel lining advanced. 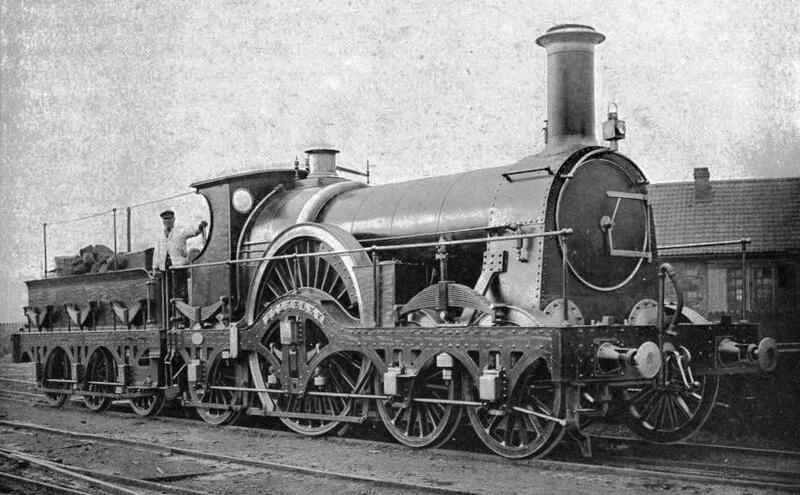 THE “QUEEN BOADICEA”, OF THE 4-6-0 CLASS, DESIGNED FOR THE HEAVIEST AND FASTEST EXPRESS SERVICES. The tunnel is of semicircular arch section, with a diameter of 20 fret inside the lining, and a headway of 20 feet in the centre. A permanent pumping plant was installed on the Welsh side, together with a ventilating system. The pumps are capable of meeting any demand that is likely to be made upon them by the spring which caused so much trouble in the early days, so that now no water finds its way into the bore, the spring emptying into and being removed from the shaft provided for the purpose. The tunnel was opened for goods traffic in September, 1880, after some 13½ years’ labour. When work was in full swing over 4,000 men found employment. Although longer tunnels have been bored in other parts of the world, few have offered such perplexing and peculiar difficulties as were encountered under the Severn. Passengers first travelled by railway under the waterway on December 1st, 1880, and to-day it is a busy artery, seeing that it constitutes the shortest and most direct route between London, Bristol, and South Wales. ERECTING ONE OF THE MAIN SPANS OF THE ROYAL ALBERT BRIDGE, SALTASH. The mass of wrought iron, 460 feet in length, weighed 1,060 tons. It was floated out to the site on pontoons and lifted 3 feet at a time by jacks as the masonry piers were built up to the designed level. Milford, which offered an excellent natural harbour. When the engineers came along half-a-century later they found traces of Brunel's work on every hand as well as some miles of the rusting derelict railway which the master engineer laid down. His grades, running up to 1 in 27, however, were too steep, so a new and more level line was fashioned with no banks heavier than 1 in 100. By this means the Welsh port was brought within 202 miles of London over a line adapted to fast travelling, which has been demonstrated convincingly since the incoming Cunard liners dropped their American mails and passengers at this point. While the original London and Bristol line has been brought to a high state of efficiency, and enables passengers to cover the 118 miles between the two points in 120 minutes, a new route for western points has been laid parallel to the parent road, though some miles to the south, between Reading and Taunton. In this way the old line via Bristol has been relieved of a considerable volume of traffic. A fast through line has been provided also between London and Birmingham, as well as other important points in the western midlands. To-day the system embraces 3,000 miles of road over which travel considerably more than 100,000,000 people every year. The Great Western Railway ranks at present as one of the most substantial, fastest, and smoothest travelling lines in the world, while its long distance expresses stand supreme in point of speed, comfort, and luxury. 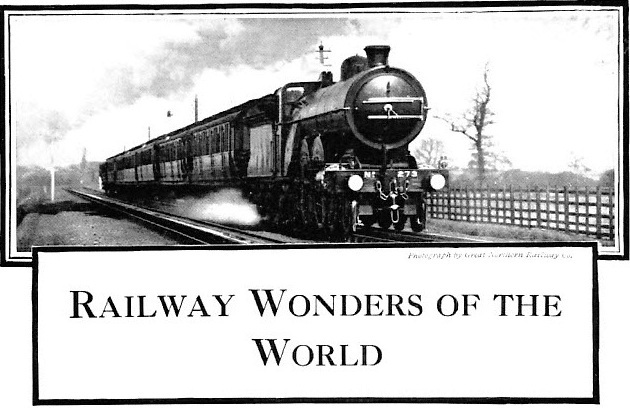 You can read more on “The Cornish Riviera Express”, “The Severn Tunnel” and “The Story of the GWR” on this website.